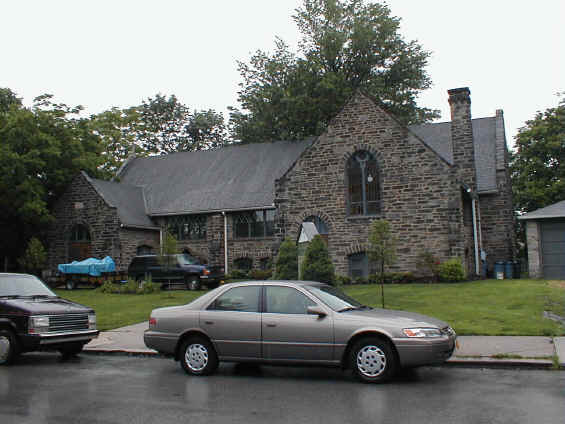 Church History St. Luke's was originally a mission of Christ Church, Ridley Park, PA.
"Our fourth mission, St. Luke's, Eddystone, started as St. Peter's Mission in 1912. Meetings took place in private houses at first and from there they eventually moved to the Town Hall under the leadership of the Rev. William H. Anthony. Then, a great benefactor came on the scene. Samuel M. Vauclain not only gave the land on 10th Street but had the church and parish house built as well, at no cost to the congregation. Work started in 1915, and St. Luke's Church was opened under its first rector, the Rev. Mr. E. A. MacNamara in 1917. At this time, the church became independent of Christ Church." The building is still standing but is no longer an Episcopal church. It is now St. Jude's Catholic Church. Beginning with Sunday, July 25, 1915 regular services were held in the Town Haoo, under the direction of The Rev. W. H. Anthony. On Saturday afternoon, July 31, 1915 the corner stone was laid by Bishop Garland. The Rev. Francis M. Taitt, then rector of St. Paul's Episcopal Church, Chester was present. Approximately 200 persons were present on this occasion. Mr. Samuel Vauclain who was at the time President of the Baldwin Locomotive Works, gave the buildings to the Diocese in memory of his son. The last service in the Town Hall was held November 28, 1915. On the following Sunday, December 5, 1915 the congregation attended the 11:00 service at St. Paul's Chester and the Rev. W. H. Anthony celebrated the Holy Communion. This mission was first called St. Peter's. The first service held in the new church building was at 11:00 a.m. on the third Sunday in Advent - December 12, 1915 at which time the Rev. W. A. Anthony officiated at Morning Prayer and Holy Communion. Ninety-two persons were present for this service. At 7:30 p.m. on the first Sunday in Lent, March 12, 1916 the building was dedicated by the Rev. Philip M. Rhinelander, who at the same time confirmed nine persons. Tuesday, March 14, 1916 ground was broken for the Rectory. Then followed Lay Services until December 9, 1917 when The Rev. E. A. Macnamara took charge. Following World War I the parish house was used as a recreation building for men in this area. On August 18, 1918 the reredos was erected. A "Eucharist for Victory" was celebrated on November 17, 1918. A Men's Club, Woman's Guild, and Sunday School were active organizations by this year. Thoughts were given to forming a choir during this year. The vestments were made by the parents of the choir members. Mr. Macnamara's last service here was held Sunday, January 31, 1921. Services were then conducted by Lay Readers: Sydney T. Cooke, P. G. Hall, J. S. Platt, William J. Flanagan, Oscar C. Taylor, H. Benns, Thomas Hardy, Thomas Baxter and Dean Francis M. Taitt of Chester until the arrival of Rev. W. E. Warren on Easter Day, 1923. He officiated at a 9:00 Service and preached. Mr. Warren entered into Life Eternal on Thanksgiving Day, 1929. A lace communion cloth was presented to the church by Mrs. Isabella Grieser in memory of her mother, Isabella Baxter. New pews were given by Samuel Vauclain and first used June 29, 1924. Albert Firth was hired as organ pumper to be paid 10 cents for the Morning Service, 10 cents for Evening Prayer and 5 cents for choir rehearsals. In May a rummage sale was held to raise funds for a motor for the church organ. Eucharistic candlestick holders were presented to the church in memory of Rev. Warren by his wife, Anna K. Warren. Rev. Carl Appelberg began his ministry here March 2, 1930 and served until 1934 at which time he returned to his native land, Denmark. Cushions for the altar rail were given to the church by Mr. and Mrs. Walter Eckels. Dates of presentation cannot be found for the Altar Service Book and Sanctuary Book of Common Prayer given in memory of Wm. Johnson who entered life Eternal in 1928 and Jennie C. Johnson, 1930. Rev. Joseph Paul Morris served in this mission from 1933 until 1935 at which time he was called to Prince of Peace Chapel, Philadelphia. From September 1, 1935 until January 31, 1946 The Rev. Frederick B. Hornby served as vicar of St. Luke's. During his ministry an active Young People's Fellowship was organized and Daily Vacation Bible School sessions were held during the summers for a period of two weeks. A Boy Scout Troop was active. A Communion Set was presented to the church in memory o Millie Booth Bergantz by friends in the parish. During the summer of this year the garage was built to house 2 cars. The candelabra in use at the present time were given as memorials to Samuel M. Vauclain during our 25th Anniversary Service on October 20, 1940 by the church. During this service the Lesson was read by Rev. Joseph P. Morris, the candelabra were blessed by The Very Rev. S. V. Wilcox and the sermon given by The Rev. William H. Anthony, Rector of St. Peter's Phoenixville, First Vicar of St. Luke's Mission, Eddystone. Flowers on the altar were given by the Young People's Fellowship in memory of Alfred Edward Macnamara and William Edward Warren, former vicars of this church who have entered Life Eternal. A reception was held in the parish hall. The cake was given by the Sunday School. During the years of World War II the parish house was used as an emergency Aid Station for Civilian Defense with members of the congregation taking an active part. A very impressive Epiphany Candlelight Service was presented on a cold, icy night by members of the Young People's Fellowship. The Rev. John H. Morgan became vicar of St. Luke's on March 1, 1946 and served until July 1, 1948 when illness caused him to retire. 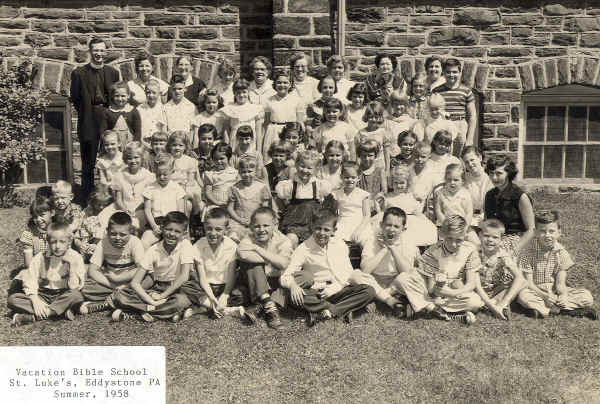 In January, 1948 St. Luke's Eddystone welcomed into its parish family members of St. Luke's, Chester. The Y. P. F. which had disbanded temporarily was brought back into an active group under the supervision of Mrs. Mary Rusk, Herbert Wardius, and Rev. Morgan. This group presented a silver dish for the baptismal font in memory of David G. Hornby who entered Life Eternal. On May 8, 1949 Communion Cruets were presented in memory of Mrs. Anna Mary Orner by her daughters, Mrs. Catherine Alexander and Mrs. Harry Nixon. A Communion Wafer Box was given by The Woman's Auxiliary. On May 12, 1949 The Rev. Arthur F. Gibson became vicar of this mission and served until June 15, 1952 at which time he was transferred to St. Titus's Church, Philadelphia. The Junior Choir was organized by Helen Abramchuk and Mrs. Earl Tyson during this year. The children took an active part during the 11:00 Service and represented St. Luke's Church School at the Mite Box Presentation Service at Episcopal Academy. On October 8, 1950 a Wurlitzer organ was blessed and dedicated by Bishop Oliver J. Hart and Dean Leifert. The organ was a gift of members of the church along with funds donated by the St. Luke's Guild. During this special service a Baptismal Font was blessed and dedicated in memory of David G. Hornby, given by Mr. and Mrs. F. B. Hornby. On Christmas Eve, The Altar Service Book was presented as a gift to the church by Rev. Gibson. In October of this year our Church School was host to the Southwest Church School Association. Rev. Joseph P. Morris was guest speaker at our Anniversary Service this year. On May 18, 1952 flower vases were given in memory of Alexander and Annie Montgomery by their daughter, Mrs. Elizabeth Schoenberger. On June 15, 1952 Harry R. Johnson, Jr. came to serve this mission, and was with us until June 1, 1955 at which time he was transferred to St. John's, Essington. Mr. Johnson was ordained into the priesthood at St. Stephen's Norwood and conducted his first Holy Communion Service at St. Luke's on December 19, 1952. A Young People's Fellowship was again organized and a Cub Scout Troop formed during Mr. Johnson's ministry. Alms Basins were presented on Easter Day in Memory of Nancy Hewes Johnson by the Myra Circle. In June red liturgical hangings were given in memory of William K. Reed, long-time treasurer of St. Luke's by his wife, Mabel Reed. In October white liturgical hangings were given in memory of Lillian, Laura and Florence Goodman, Annie Pyett, Clinton Dubhorn, and Dora Abramchuk by William Goodman, Pyett Family, Mrs. Elsie Morgan, and Abramchuk Family. The First Annual Bazaar was held on September 24 and 25 on the church lawn with Helen Abramchuk as chairman. The proceeds of $810.00 were used for the combination storm sash and screens for the Rectory. In January, 1955 a baptismal font cover was given in memory of Myra G. Hornby by the Myra Circle. The four women's organizations (St. Luke's Guild, The Woman's Auxiliary, Altar Guild, and Myra Circle) were merged into one group and met as a combined group in February, 1955. An Acolyte Guild was formed in January with Arthur Hartmann serving as director. Purple liturgical hangings were presented in honor of Mr. and Mrs. Walter Cook, Sr., by their daughter, Mrs. John Morgan. Green liturgical hangings were presented in memory of Thomas Morralee, William and Bertha Harper, William Howard and in honor of Mr. and Mrs. Charles Firth by Mrs. Ruby Morralee, Harper Family, Mrs. Mary Howard, and Mrs. James B. Vernon. Richard C. Chapin, who served as Seninarian-in-Charge of St. Luke's starting September 1, 1954 was ordained Deacon at St. John the Evangelist Church, Lansdowne on May 14, 1955 and was appointed vicar of St. Luke's beginning June 1, 1955. Mrs. Raymond Macdonald served as Chairman of the 2nd Annual Bazaar which was held on September 16 and 17. The proceeds which to-date net $950.00 will be used to defray expenses of the new oil burner which has been installed in the Rectory and the remainder will be used to renovate the kitchen in the parish house. At present there are 171 communicant members of St. Luke's. On this our 40th Anniversary we hope that "new life will begin at 40." Let us thank God for our many blessings in the past, especially His guidance through trying times. With thankfulness in hearts may we work together so that in years to come we may grow in unity and strength as a parish family so that we may further the prayer offered by Bishop Garland during the Service of the Laying of the Corner Stone on July 31, 1915. After the stone was laid in its place, the Bishop, striking it three times with the trowel said: "In the Name of the Father, and of the Son and of the Holy Ghost. Amen. I lay here the Corner-Stone of this Parish House for St. Luke's, Eddystone, to be used in the reaching and training of the young in the truths of Christ's religion, and for the furtherance of the cause and work of His Holy Church in all godly ways. Blessed be God forevermore, in Whom we have redemption through the Blood of His Son Jesus Christ. Amen." The Rev. Richard C. Chapin was ordained Priest here in November, 1955, and served as Vicar until April, 1959. A notable contribution during this period was that of an ever-increasing emphasis upon the Church School. The Rev. George W. Davison was appointed as short-term Vicar for a two months' period following the tenure of Fr. Chapin. The Rev. David B. Kenney came here as a Deacon, was ordained Priest here in December, 1959, and resigned for another position at the end of May, 1961. Without doubt, however, the area in which the greatest changes have been needed, and in which those brought about have been most evident, is that of the property. From funds within the Congregation, we now have a Mimeograph machine, a Power Mower, a Dehumidifier, a proper Piano for Choir rehearsal use, and repainting the Church proper... In addition, the trees have been trimmed, and the unattractive and long-neglected privet hedge has been removed; many plantings that had outlived their usefulness and/or beauty have been cleared away --- so that now the Church and Vicarage buildings can at least be seen from the street! The Vicar has been able to secure gift funds for the above items, in the amount of just under $5,500. In addition, less than a week before the present Anniversary Celebration, a contract has been let for urgently required exterior work, to preserve both buildings --- caulking and painting and waterproof sill protection around all windows, together with patch-pointing of all stone surfaces. The $2,275 for this work is being given by the Diocese. In short, of the $10,000 roughly estimated to be needed in 1961, there will soon have been expended a little under $8,000 --- all obtained at no cost whatsoever to members or organizations within this Congregation, but entirely from outside gifts and grants. With the property in good and sound shape, and with the growing feeling of our being a true "family-in-God", we should be able assuredly and confidently to step forward, as we enter upon the second half-century of the Church here, in and for the borough of Eddystone and the surrounding area. � 2000, 2001, 2004, 2006 John A. Bullock III.